American Potash Corp (CSE: AMP) has been discussed quite frequently over the previous few days, and for good reason. From just seven sessions ago, the stock has increased in value by over 100%. Now, considering the current price of $0.145, that may not seem all that remarkable. What is remarkable however, is the sudden desire for the equity to get away from its bound range. 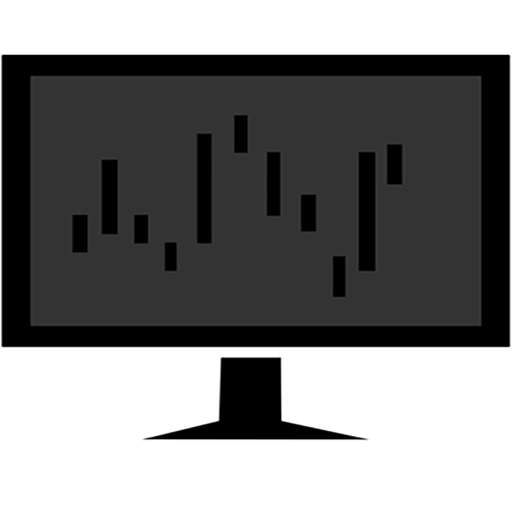 This sudden price action hasn’t gone unnoticed, on January 4, 2018, the company was forced to issue a release indicating that they didn’t know the reason behind the sudden activity. Financials had been released at the end of the previous week, and that was about the only catalyst the company had going for it. Until that is, you look at its tight share structure. We’ll begin our briefing on the topic by looking at the current outstanding share count of American Potash. Given the excitement surrounding the lithium sector presently (contrary to its name, it is involved in lithium as much as it is potash), its a surprise this company hasn’t been discovered earlier. When its all said and done, this company has a very low outstanding share count. American Potash’s outstanding share count as of October 31, 2017. 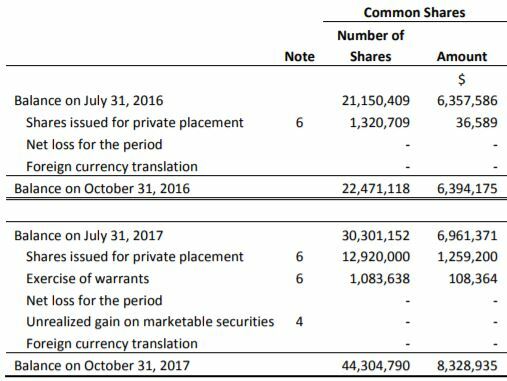 As of October 31, 2017, the company had a total of 44,304,790 shares outstanding. Since these financials were released last month, the company did announce that they intend to settle $15,000 in debt by issuing 125,000 common shares at a price of $0.12. This has not been completed as per the Form 7 filed yesterday by the company. However, when it does it will bring the total outstanding share count to 44,429,790. Using this figure, based on Tuesday’s closing price of $0.145, the company has a market valuation of roughly $6.442 million. Not bad considering that seven sessions ago the valuation was approximately half of that. Although the share structure at the present time is very tight, we can’t discount the impact derivatives will have on the overall share structure. To say the least, they will provide some selling pressure should American Potash really start to climb northward. American Potash’s outstanding options as of October 31, 2017. In terms of the current outstanding options, the company is in an excellent position. While there are 2,400,000 in total outstanding, 600,000 of those are entirely out of the money and are set to expire on January 16, likely unexercised. The remaining options are largely many years out and are therefore unlikely to cause any selling pressure at this point in time. American Potash’s outstanding warrants as of October 31, 2017. Unfortunately, the currently outstanding warrants paint a slightly different picture for the future of the companies share structure. As of October 31, 2017, there were 29,902,642 warrants outstanding as seen above. This number in all reality is somewhat lower. To begin, based on the Form 7 filed on January 8, the company saw no warrants exercise in the previous two months. This is being calculated based on the outstanding share count given. In turn, this means that 2,573,071 warrants subsequently expired without being exercised last month. Next on the list, is the two sets of warrants with a weighted average exercise price of $0.60. With an estimated expiry of March 8, 2018, it is unlikely that these will be exercised due to being out of the money. This is only an estimate though, as who knows what may happen to the equity in the next two months. Should they expire out of the money, this will remove a further 1,639,400 warrants from the total outstanding figure. When these three sets of warrants are collectively removed from the equation, it gives us a total of 25,690,171 outstanding warrants. 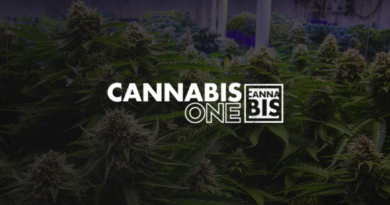 Mixed in with the current outstanding share figure of 44,429,790, and the estimated 1,800,000 relevant options, and we come to a fully diluted share count of 71,919,961. Based on Tuesday’s closing price of $0.145, it gives American Potash a fully diluted market capitalization of $10.428 million. The last item with regards to the share structure of the company that needs to be addressed, is the current insider holdings. For ease of use, we compiled the data in to a nice table to make it easier on everyone’s eyes. American Potash insider holdings as of January 9, 2018. Overall, it is estimated that just over 15% of all outstanding shares are owned by insiders of American Potash. On a fully diluted basis, this figure is slightly higher at 16%. One item of note however, is that we did not include options owned by insiders with a $0.50 exercise price, as we had previously discounted these shares from our fully diluted count already. It is believed that all of these options were insider owned. 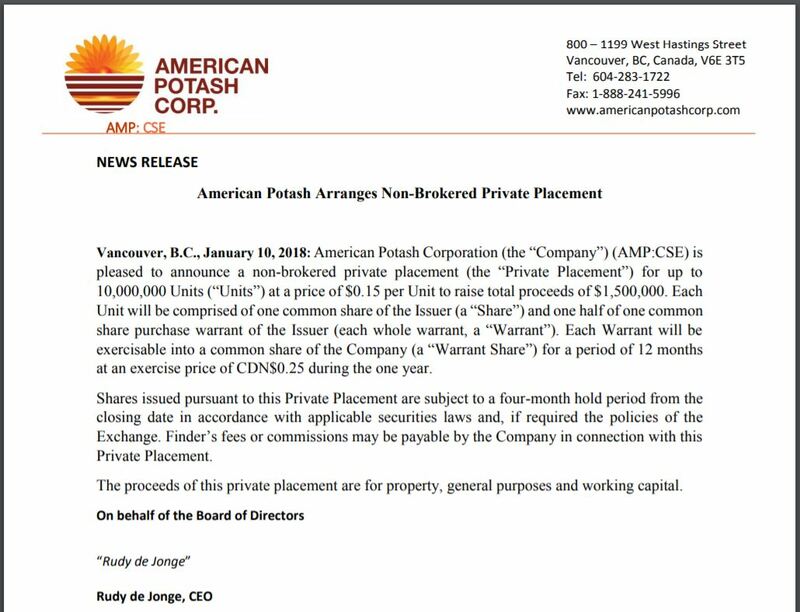 American Potash’s hot off the presses private placement news release. Yes, that there is the details of a private placement for American Potash Corp. It was actually uploaded to the Canadian Securities Exchange the evening before the published date. This was just in time for us to catch it, which was great. Assuming the placement isn’t oversubscribed, it’ll add 15,000,000 shares to the company on a fully diluted basis, plus the appropriate finders fees. The unfortunate part about this, is the additional cheap paper that the company is printing just as its trying to find some legs to move to the north. This serves as an excellent reminder however that the market never sleeps, and you need to constantly be examining your investments. Be aware of market news. Don’t ever think you know all there is to know on an investment. Dive Deep. Information for this analysis was found via The CSE, SEDAR, SEDI, and American Potash Corp. The author has no securities or affiliations related to this organization. Not a recommendation to buy or sell. Always do additional research and consult a professional before purchasing a security.